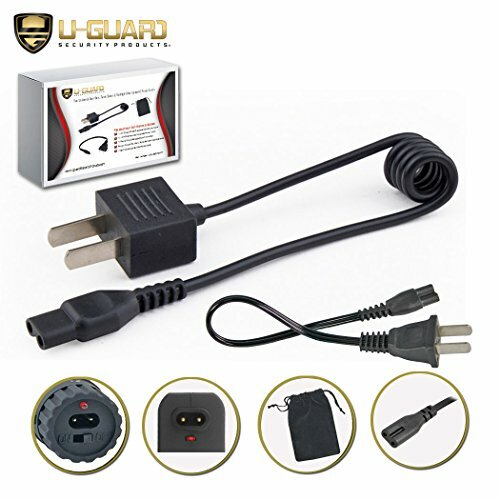 The universal stun gun charging cords included in the 2 pack by U-Guard Security Products are designed and manufactured to fit all models that have internal rechargeable batteries and the power cord cable plugs directly into the stun device. These power cords are for standard North American AC wall outlets and fit several brand stun guns, flashlight stun gun combos, Lipstick stun guns, stun gun cell phones, stun gun batons and several older model as well as new models. Some of the most popular stun devices these power cords fit are; Vipertek, Guard Dog Security, Streetwise, PoliceMart, Stun Master, Jolt, Monster, Terminator, Barracuda, King Cobra, Sabre, Cheetah, Bull Dog, Diablo, Pit Bull, UZI, Omega, Panther. Please review the Amazon listing product Images to visually identify the plug in the back of your rechargeable stun gun to make sure the plug configuration is correct for your model. Items Included in this listing are the two universal rechargeable stun gun charging power cable cords along with a accessories protective storage draw string pouch to hold your power cords. ➠ ENHANCED EXTENDED LENGTH HD STUN GUN AC TASER POWER CORD: The Heavy Duty Premium Coil Stun Flashlight / Stun Gun Charger Adapter Cable Is An Exact Fit Improved Design From The Original Equipment Manufacture Recharge Cable. This Cord Extends A Full 14" Doubling The Original Stun Device Charge Cord Length. ➠ ORIGINAL EQUIPMENT STUN GUN CHARGER CORD: Also Included In the Stun Gun Accessory Kit Is An OE Fit 9" Straight Power Stun Gun Flashlight AC Charging Cord. The Kit Includes (2) Style AC Electric Wall Outlet Cables That Will Work With Most Popular Self Defense Non Lethal Stun Devices. Both Power Cords Are Interchangeable And Will work For Many Styles, Designs And Brand Stun Guns And Flashlight Stun Guns. ➠ FREE PROTECTIVE STUN GUN ACCESSORIE POWER CABLE STORAGE POUCH : To Help Keep Your Stun Gun Power Cords And Accessories Together. U-Guard Security Products Includes A Protected Storage Bag To Securely Keep The Power Cords In One Place For When You Need The Charging Cables. ➠ 1 YEAR PRODUCT WARRANTY: We Are Confident Of Our Product Quality Design And Materials. The Power Cords Are Durable And Designed To Last. We Offer A Full One Year Replacement Warranty From Manufacture Defects If You Have Any Issues With Our Products. If you have any questions about this product by U-Guard Security Products, contact us by completing and submitting the form below. If you are looking for a specif part number, please include it with your message.